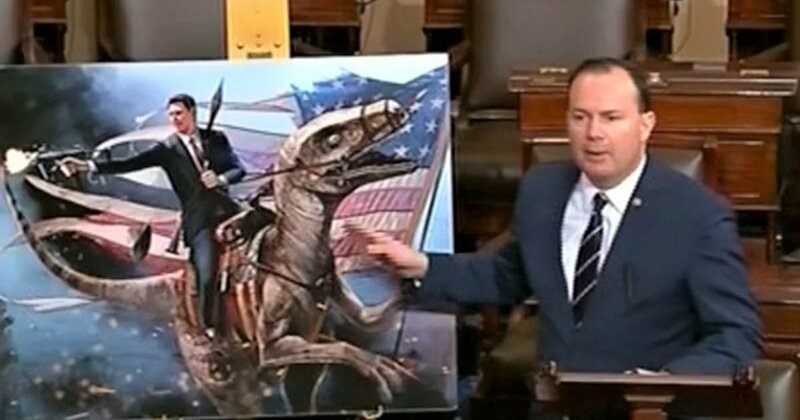 Washington • To poke fun at a liberal plan to tackle climate change, Sen. Mike Lee on Tuesday took to the Senate floor with a poster of President Ronald Reagan riding a dinosaur while firing a machine gun. The Utah Republican, a serious conservative not generally known for prop-supported political stunts, said his point was that the Democrats' Green New Deal was as absurd as the poster he was showing. "I rise today," Lee said, "consider the Green New Deal with the seriousness of the deserves." The proposals include guaranteeing a job at a living wage, with paid family and medical leave, vacation time and retirement security, health care for all, access to higher education and repairing or replacing aging roads, bridges and sewer system. It also calls for making all energy consumed in the United States emission-free, adding new energy-efficient buildings and eliminating manufacturing that causes pollution. Lee pointed out that his poster also included a rocket launcher strapped to Reagan's back and a tattered American flag. There was no battle with or without velociraptors, ”Lee said. "The Cold War, as we know, was won without firing a shot." Lee offered up his own solution to climate change: babies. Freshman Rep. Alexandria Ocasio-Cortez, a New York Democrat who is sponsoring the Green New Deal in the House, fired back at Lee in a tweet. "GOP Senators are using their Congressional allowances to print Aquaman posters for themselves to argue that a #GreenNewDeal saving our nation from climate change is a who ste of money, she said, using an emoji that is laughing so hard, it's crying.